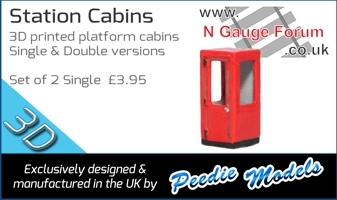 Bought three of these whilst visiting Ikea at the weekend, one for each child to use as a toy box and one for me to play with… I have seen people make use of them on another forum in 00 gauge but would certainly be more handy in our superior scale 27”�l x 14”�w x 11”�h. I was thinking of putting the box on its side and using the lid as a fiddle yard board, something like a simple single line terminus with a couple of stabling roads. I would like to incorporate a little of everything from ‘Melton’ but on a smaller and freelance scale, just as a practice run before getting serious with the big one! Stabling lines one overgrown and one set in concrete preferably. I think thats what I was planning just not capable of writing it down! 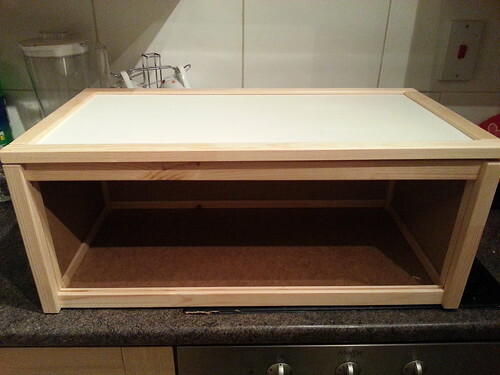 Heres a few pictures of the progress so far… only to be described as building the box and putting some stock in it! 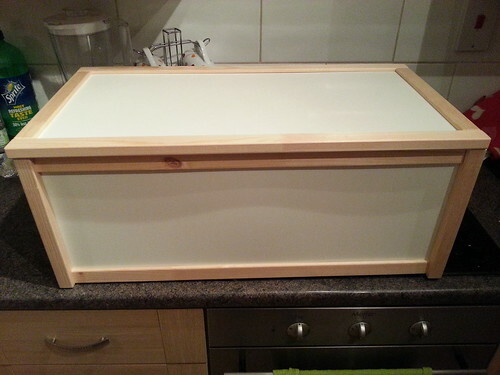 I have decided to use the lid as a removable fiddle yard. I am also toying with the idea of putting the long side back in and removing the panel from the end of the box so it is viewed from the end? I am also toying with the idea of putting the long side back in and removing the panel from the end of the box so it is viewed from the end? Also developed the idea into this, the modern platform and station in on a high level, maybe an old ‘recycled’ viaduct (like the tram station in Nottingham) with an adjoining modern multi-storey car park up to the same height and a low relief shopping centre alongside. The freight bit at the bottom level would be viewable through and above the multi-storey or from the side (if opened). It would be a bit overgrown and unloved, perhaps with some additional mothballed/lifted lines and a bit of decay! Now how would I hide the scenic break on two levels effectively? Can I have some suggestions/inspiration please? Posting on my phone give issues!!! Note to mods, this can be moved to the under construction forum, I have aquired the wood for the baseboards, track and points. Construction will start this evening! Wanted, Very very cheap controller, something very basic... just to get things tested with. There seem to be quite a few Gaugemaster Combis going for relatively low prices on fleabay right now. The price depends on how many people have noticed them, of course, and how much they're prepared to bid. If you watch them all, a bargain will certainly come up sooner or later. I have made a start on constructing APA Park My micro project. 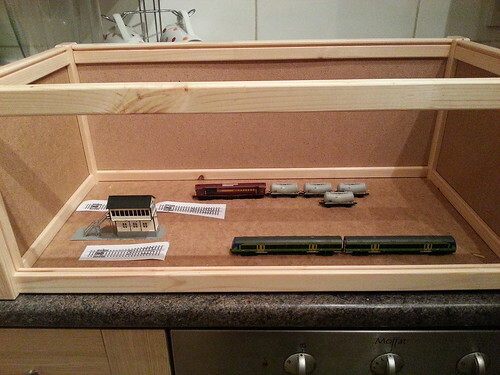 The lid of the box becomes the fiddle yard which will attach to the right hand side. The lower level is designed to give the impression of the end of large yard. Loco and the first few wagons emerge under the bridge, uncouple and run round/draw forward. This will enable me to run a variety of stock. The very front line will be edged with concrete apron to the front but not set in the tracks (I have a plan for this). The top level will be a new build station ‘minimal’ on a recycled blue brick viaduct built to serve a shopping complex which will be low relief behind. To the left will be a low relief multistorey car park that you will be able to look through and see the activity in the yard. To the right will be a modern concrete over bridge carrying a major road. Last night I cut the boards and started laying track ‘loosely’ to work out where isolators and droppers will need to go. 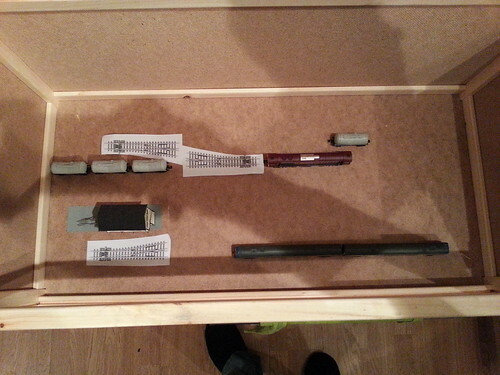 Tonight I will start cutting out the ends of the box for viewing and for the fiddle yard access. For a cheap controller you can't go wrong with the cheap controller that Bachmann supply with their sets. If any of the sets appeals then they are normally very good value, or alternatively you can often find them split from sets for £10-15.